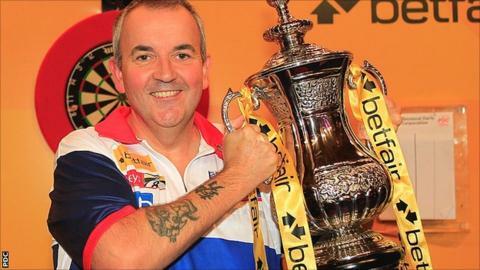 Phil Taylor believes he can improve his fitness after winning the World Matchplay title in Blackpool on Sunday. World number one Taylor, from Stoke-on-Trent, won a title, beating James Wade 18-15 in the final at the Winter Gardens. "I don't think I was fit enough and I didn't perform as well as I can, which I'll work on over the summer," he said. "It was a difficult final for me. I'm getting older and I'm not as fit so I've got to work harder." Taylor, 51, added: "I tried some new darts at the start of the week and they are the best darts I've ever played with, but they weren't flying through the air in this heat as they should do. "I need to practice a bit more with them, which I will do, and to be honest I was thinking about them too much." Wade, the 2007 World Matchplay champion, said his preparation for the event was as good as it could have been, although he was left disappointed with his performance in the final. "From a spectator's point of view it was a great final and from Phil's point of view it was a great final too," said Aldershot's Wade. "For me, I was playing at half-mast, so to not play that well and get 15 legs from Phil is very good. "I've never felt this happy playing darts and I've never felt so encouraged to play darts, because I've had seven weeks of hard practice and done this, which should be quite frightening for other players."